Chemotrophs are a class of organisms that obtain their energy through the oxidation of inorganic molecules, such as iron and magnesium. The most common type of chemotrophic organisms are prokaryotic and include both bacteria and fungi. All of these organisms require carbon to survive and reproduce. The ability of chemotrophs to produce their own organic or carbon-containing molecules differentiates these organisms into two different classifications–chemoautotrophs and chemoheterotrophs. 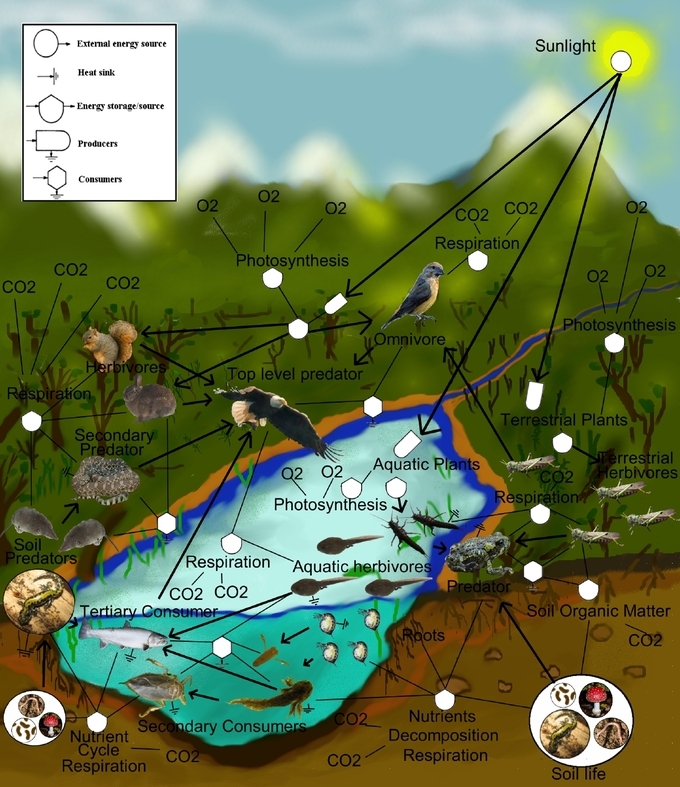 Organismal and environmental interactions in a wetland: sources of energy and carbon for each trophic level. Chemoautotrophs are able to synthesize their own organic molecules from the fixation of carbon dioxide. These organisms are able to produce their own source of food, or energy. The energy required for this process comes from the oxidation of inorganic molecules such as iron, sulfur or magnesium. Chemoautotrophs are able to thrive in very harsh environments, such as deep sea vents, due to their lack of dependence on outside sources of carbon other than carbon dioxide. Chemoautotrophs include nitrogen fixing bacteria located in the soil, iron oxidizing bacteria located in the lava beds, and sulfur oxidizing bacteria located in deep sea thermal vents. Chemoheterotrophs, unlike chemoautotrophs, are unable to synthesize their own organic molecules. Instead, these organisms must ingest preformed carbon molecules, such as carbohydrates and lipids, synthesized by other organisms. They do, however, still obtain energy from the oxidation of inorganic molecules like the chemoautotrophs. Chemoheterotrophs are only able to thrive in environments that are capable of sustaining other forms of life due to their dependence on these organisms for carbon sources. Chemoheterotrophs are the most abundant type of chemotrophic organisms and include most bacteria, fungi and protozoa. Chemotrophs are organisms that obtain energy by the oxidation of electron donors in their environment. Chemoautotrophs use inorganic energy sources to synthesize organic compounds from carbon dioxide. Chemoheterotrophs are unable to utilize carbon dioxide to form their own organic compounds. Their carbon source is rather derived from sulfur, carbohydrates, lipids, and proteins. inorganic molecule: lacks carbon and hydrogen atoms.